What is your theory on the disappearance of Madeleine McCann? This story - based on a sort of review of the Netfix documentary - appeared today in the Australian media. It lists seven suggested theories about what happened to Madeleine McCann, including 'death by accident', the PJ/Goncalo Amaral theory. I will put up a poll, listing the seven options (in the same order as in this Australian article). I will split the 'Death by Accident' theory into two by asking: 'On 3 May, or BEFORE 3 May'. This particular lone wolf was one of many operating in the area at the time of Maddie's disappearance. The Disappearance of Madeleine McCann also looks at how sniffer dogs used in the case allegedly detected the scent of blood, and a human body, in the McCann's apartment and in their hire car. After watching the documentary, many people have suggested that all three of the McCann children could have been drugged, while they were playing at the kids' club earlier in the day. Apparently Madeleine was very sleepy when she returned to the holiday apartment and went straight to bed. Her younger siblings, Amelia and Sean, also didn't wake throughout the night as people came and went from their bedroom. The documentary speaks to a man who claims a woman approached him in Barcelona the night Maddie disappeared. The man says the woman spoke English, with possibly an Australian accent, and asked him, "Do you have the girl? Do you have my new daughter for me?" Another theory is that something nefarious happened to Madeleine, but the Portuguese police tried to pin it on the McCanns because they didn't want tourism to suffer. "It's much easier to say: 'Aha, we've found some idea later that the parents could be involved in this'." There have been 63 votes already on this poll - and the early results are interesting. I voted nr 9. My belief is either that or nr 4. Whatever it was, it must have happened before May 3d. An accident could have been handled in another way, without all the strange things that have surrounded this case for years. And IF it was an accident, I doubt it had anything to do with neglect. Something more sinister was in that case the cause for something to have happened...which is the reason why I question an accident to begin with. Unless we believe the theory that she came to harm whilst being left alone (neglect), we are left with intentions to hurt Madeleine. Even if her death was unwanted and unintended, the first action that led to it was intended by the person who is responsible for her death. @Rachel007 wrote: I voted nr 9. My belief is either that or nr 4. Whatever it was, it must have happened before May 3d. I think that is a perceptive post. I'm surprised you've only got three 'Likes' so far. „Tapasfriends“ might have believed that Madeleine actually was abducted, meaning that whatever happened was and still is the McCann couple‘s secret. I don‘t believe that for a second. Such a scenario would need the neglect to have been a fact. Otherwise the abductor would not have had a chance. His or her opportunity existed ONLY in the period between checks. No way the Tapasfriends thought this had happened. Ok there might be some varieties in the depth of what each person knows - but still not a single one of the group thinks that Madeleine McCann was abducted. And for the time and date; What can you do, no matter how panicked you are, in just a few hours to warrant a saga about an abduction that holds for 12 years?!? ´how could we have concealed her body in such a short time? It’s ridiculous.´. Yes indeed it’s ridiculous. Because it all happened before! But by placing the Tanner sighting and also the Smithsighting (which both are pure rubbish) on the Thursday 3d, it strengthens people‘s beliefs that it all happened on that day. ´How could we have concealed her body in such a short time? It’s ridiculous.´ Yes indeed it’s ridiculous. Perhaps we should take Gerry at his word? Was he speaking the plain truth to us, in plain sight? They COULDN'T have hidden the body & raised the abduction alarm within just 3-4 hours. So it all must have happened much earlier? 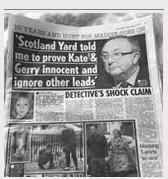 Indeed, it has always been Gerry's defence that they couldn't have hidden Madeleine's body in the time frame between 5.30 and 10 p.m. and it's been Kate's defence that they couldn't have moved her body later in the hire car. The P.J. think both scenarios are entirely plausible and I must say I agree with them. Four and a half hours - whew! that's more than half the traditional eight hour working day! Hi Rachel. Dr. Amaral and the P.J are experienced investigators into major crime. 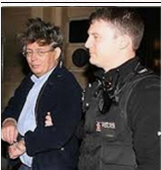 Mark Harrison was, in '07, the leading U.K. body recovery expert and adviser to British police forces. Both of these vastly experienced investigative forces concluded that Madeleine was dead and that her body could be hidden somewhere in the Praia da L. area. They were fully aware of any constraints imposed by the timeline they were working from. None of these experienced professionals concluded that it was impossible to have hidden the body and covered up the crime in the time between when Madeleine was last seen independently at high tea and the raising of the alarm. If it's good enough for those who are trained and vastly experienced in this field, then its good enough for me. Personally, I defer to their expertise. Hi, calpol is not primarily sedative. You cant instantly die from too much paracetamol alone. @ Tony B. The issue under discussion which sparked my reply was the claim that four and a half hours was not long enough to hide a body and cover up an accident. In this matter it is irrelevant whether Dr. Amaral, the P.J and Mark Harrison were on the case for five days, five months, or five years. They were working from a hypothesis that Madeleine had met her fate and been disposed of in that four and a half hour period. They regarded it as perfectly possible, and they are vastly experienced in such matters. Any impossibility would have occurred to them pretty quickly if it had existed. I absolutely have not said that Martin Smith is an "Unreliable witness" I believe he is truthful. His evidence is not strong enough to be admissable. That is not the same as being HIM unreliable. That is an important distinction. Smith's veracity should not be conflated nor confused with the potential of his testimony. I think you misunderstood the last sentence in Tony Bennets reply, it said that the PJ said that M.Smith was an unreliable witness. Not that you have said it. Only that you disagree with it (meaning you think he is reliable) and that’s also what you confirm in your latest post. Regarding the 4,5 hours to conceal a body - well to make it that actually means something had to happen promptly at 5.30 pm. And according to you Madeleine was last seen at high tea by that time. Is that realistic? At least she had to be put to bed after the tea with all little things that you do before sleeping (brushing teeth, put on pyjama etc etc.) What’s left? 2,5 or maybe 3 hours? 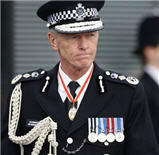 @Phoebe wrote: @ Tony B.
I absolutely have not said that Martin Smith is an "Unreliable witness" I believe he is truthful. @ Phoebe It seems you have completely misunderstood my key point. Please be so kind as to carefully re-read what I wrote. I said that you believe that Martin Smith is a reliable witness. I told you that in the PJ final report they clearly took the view (as I also do) that Martin Smith was a highly unreliable witness. You said, in terms, that the PJ were wonderful, experienced officers who got everything right. You tell me that the PJ are so wonderful and experienced that they MUST be right that Madeleine died after 5.30pm on 3 May 2007. But when the PJ say "Martin Smith was an unreliable witness", you shout: "No! He was a reliable witness!. You say the PJ were WRONG about that. Do you now see your inconsistency? Regarding the 4.5 hours to conceal a body - well to make it that actually means something had to happen promptly at 5.30 pm. And according to you Madeleine was last seen at high tea by that time. Is that realistic? At least she had to be put to bed after the tea with all little things that you do before sleeping (brushing teeth, put on pyjama etc etc.) What’s left? 2.5 or maybe 3 hours? Let's be very clear about the theory that Madeleine died from an accident after 5.30pm on Thursday 3 May 2007. Those who advocate it maintain that the four witnesses to the high tea are all telling the truth. At the very earliest,its doubtful that the McCann family were back at G5A before 5.45pm. They are all there. It is then presumed that, in the presence of all the family, Madeleine had a fatal accident after about 5.45pm. The alternative view, which I think Goncalo Amaral suggested, was that Madeleine died by accident AFTER the McCanns had left for dinner at about 8.30pm. Either alternative seems utterly improbable. 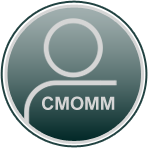 Added to that, there are some, including some members on CMOMM, who still seriously believe that, at the very time his wife Kate and her friends were raising the alarm, Gerry McCann hastened towards the beach carrying his daughter, hoping against hope that he would find a suitable place to hide or dispose of her body where no-one would ever find it. If Madeleine died while the other two children were present, you have to explain how the McCanns not only commandeered all the Tapas 7 into lying for them four hours later, and claiming that Jane saw the abductor at 9.5pm, but also explain how the twins were dealt with. Did Gerry McCann ring round his Tapas 7 mates and say: "Look, Maddie's just had a fatal accident. 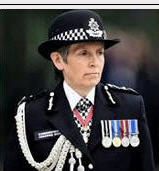 Can you please look after the twins for a bit while we sort things out and create an abduction hoax?" "Look. Maddie's had a fatal accident. Can you fake an abduction hoax while I pick up Maddie's body and try and hide it somewhere?" If one thinks this through carefully, sheer logic surely declares that there is no way on earth that Madeleine could have suddenly died that very evening? Oh...and also make sure that Nuno Lourenco is fully briefed and ready with a handy photograph of Wojchiech Krokowski's hired car, so that on Saturday morning the PJ will be sent on a wild goose chase to Germany and Poland, thinking that Maddie is with the Krokowskis! Having re read the P.J. report I see NO reference to the Smith's testimony being "unreliable". It merely points out the fact that Gerry has alibis who claim he was at the Tapas at the time of the sighting while the Smiths cannot definitely say the man they saw was Gerry. Further on this issue, the testimony of MARTIN SMITH was considered, pages 1606 and following, reporting the sighting of an individual carrying a child, in one of the streets that lead to the beach. 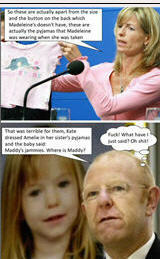 It was said that the child could be MADELEINE McCANN, although it was never peremptorily stated. Some time later, the witness alleged that, by its stance, the individual who carried the child could be GERALD McCANN, which was concluded when he saw him descending the stairs from an airplane, pages 2871, 3991 and following and 4135 and following. It was established that at the time that was being mentioned, GERALD McCANN was sitting at the table, in the Tapas Restaurant.